Welcome to my little goth christmas blog series! We’re starting with christmas jumpers and I’m hoping we’ll take everything that makes christmas good and we’re going to make it weird. If you’re a normling, then a christmas jumper means red and green, pun-tastic slogans, cute winter animals and sequins. However, if you’re a bit of a weirdo, then these are not the christmas jumpers you’re looking for. 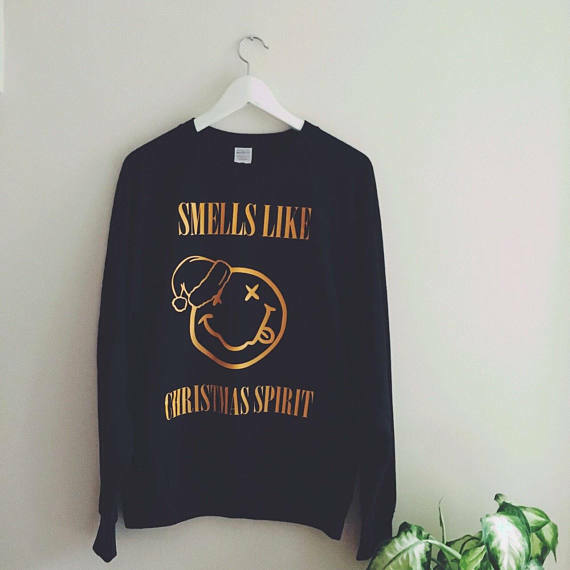 You might don one of these jumpers if you really love christmas (sure, you can pull it off! ), but the goth in you is calling you a sell-out. I’ve put together my fave gothmas jumpers so you can stay true to your dark self, to disguise all those warm and disgusting festive feelings. Of course, Killstar. 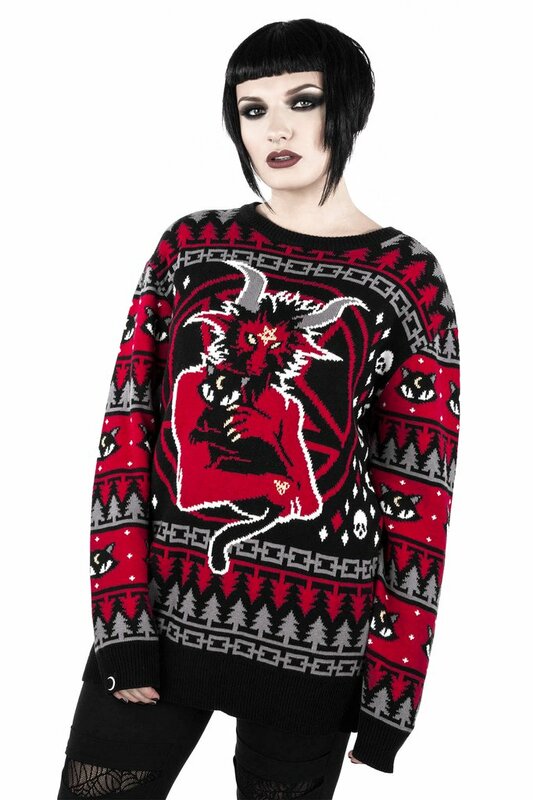 They always have a pretty good christmas jumper in the works (though as we know it’s always a bit on the pricey side with Killstar). The year with the burning churches was pretty great. This time though, they have plumped for a Lucifer-and-cat design, which as a solid cat fan I can definitely appreciate. It looks pretty snug too, like it’s actual knit as opposed to a sweater, so warms are easy to come by. 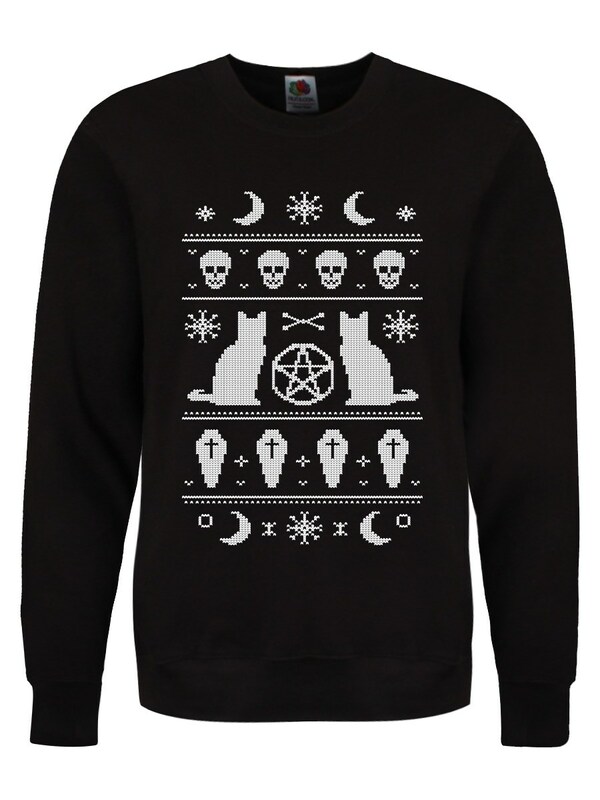 Shop the Killstar Purr Hexmas Knit here. If kitch, rockabilly style is more up your alley then Sourpuss Clothing have got a Krampus christmas jumper made just for you. It’s a bit more form-fitting for that 50s kinda style, but the sleeves look long and the fabric looks cosy. It looks super cute and I think it would be a really great present for your mum if she’s a bit of weirdo like you. The forked tongue and red eyes really makes it – definitely one to scare your gran. Shop the Sourpuss Krampus Knit from Attitude Clothing here. If you’d like to combine a reasonable price and stay true to your dark little heart, then this cross stitch design that’s riffing on the traditional Christmas jumper is pretty perfect. Instead of snowmen and christmas trees they’ve used pentacles, cats and coffins. Much better. Shop the Grindstore Bewitched jumper here. So, you can’t do a goth christmas without a little bit of Nightmare, now can you? Okay okay, get your eye-rolling out of the way. Sure it’s cliche, but that doesn’t stop us from loving it. 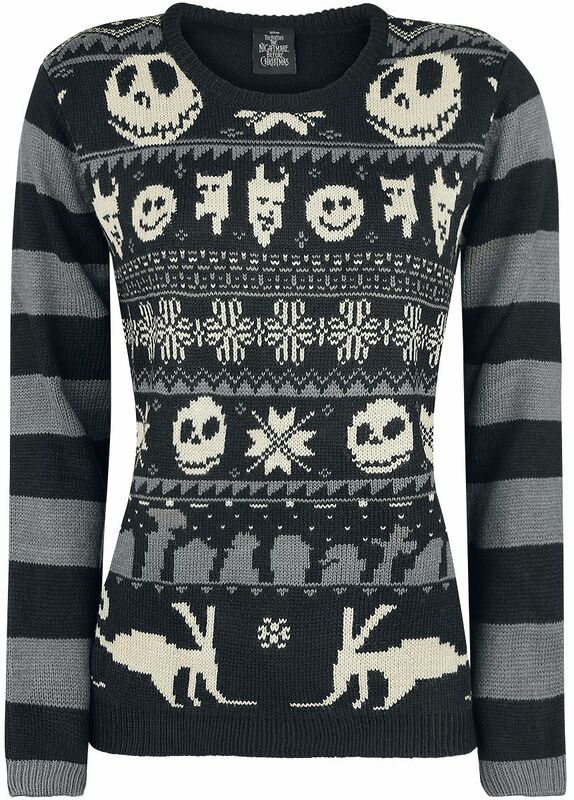 This jumper, from EMP, is just one of many (and i’m sure you’ll see little Jack Skellington’s face appear in a number of these gothmas blog posts), but the knit and the design is quite lovely. It’s even got those classic Tim Burton stripes. Though, I don’t remember an aardvark featuring too heavily tbh. Shop the EMP Nightmare Knit Stripes jumper here. For those of us who are a little more grunge than goth, there’s this offering from SabaApparel. I think it’s a smart riff that combines pop culture and christmas, and I’ve not seen it done anywhere else. It even comes in red (what) if you’re feeling really upbeat and festive! Shop the Nirvana Tribute sweater here. For extra comfort, a hoodie just makes all the difference. Whether you’re cold, feeling sorry for yourself or you need to hang out without a bra on, a hoodie is the one. So this one manages to combine comfort, christmas and the dark arts all into one. Pretty perfect for the christmas day food coma amirite or amirite. Be warned though, this one ships from Canada! 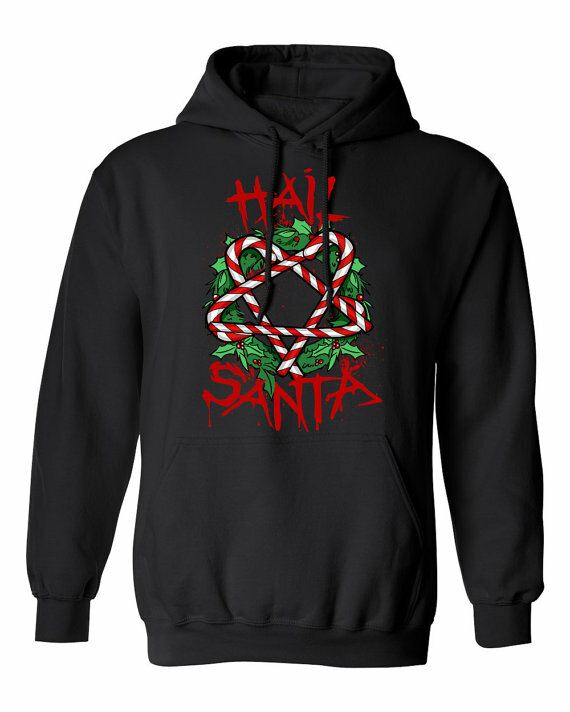 Shop the Hail Santa Hoodie here. Why is Men's Alt Fashion so Poor?